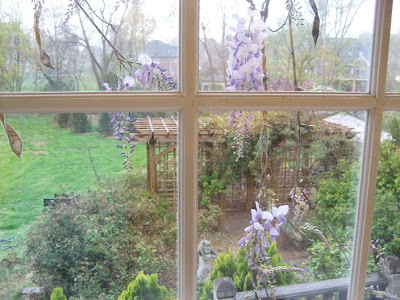 The view out my kitchen window on this rainy day. 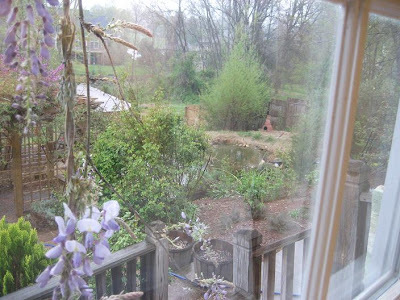 A peek of the pond in the first one. We just got the waterfall/filter turned on a few days ago. The water is really murky right now. I dream of clear water! Sad fish news: Walked down to the pond Friday to find one of the big koi dead on the path. Most likely the work of the dreaded heron. I thought the heron mostly got goldfish and couldn't catch the bigger fish. Wrong. So heartbreaking. In the second photo, the pergola that Pat built last summer. Cl. White Maman Cochet is growing on the front right. I want to plant something big on the back. I was thinking maybe Cl. Pinkie, which is an Earthkind rose. OK, roses. I had decided not to buy any more roses, but I really wanted needed another Perle d'Or (also Earthkind) for my front garden/Good and Evil Garden. 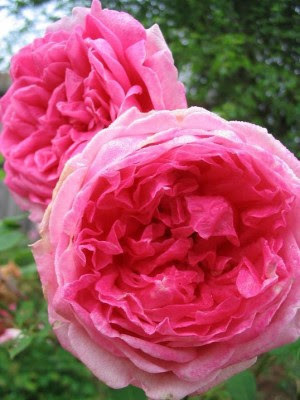 I love Roses Unlimited's beautiful, healthy, ownroot, one gallon roses. They have a three rose minimum or pay more shipping, so of course I had to order at least three. Well, maybe six. I waited too late to order though, and all but two were already sold out. So were the next four I inquired about. So far, Mrs. B.R. Cant (One of the most beautiful and carefree roses. I already have one.) and Duchesse de Brabant (another Earthkind) are reserved for me, and I've inquired about Adam, Souv. de Mme. Leonie Viennot, Gilbert Nabonnand, Mme. Lombard and Mlle. Franziska Kruger. Notice that this all started with my desperate need for another Perle d'Or, which I'm not getting. By the way, a great place to read about and see photos of specific roses is the HelpMeFind website. My Mrs. B.R. Cant from a few years ago. I am down some roses since I made my list in 2005. I'm going to do a formal inventory soon and make new markers. Oh what a beautiful garden space im so jealous!!! We need a new pergola this year...love the roses...that is the one thing we do not have..sorry about your koi, we gave what we had away because of the stray cats, and the hawks..now we just have plants in the pond...cant wait to see your gardens in full bloom!!! Click to see my paintings.